How to make homemade granola - and save a ton of money! Did you know you can make your own homemade granola recipe? Granola can be expensive to buy, I have seen it for up to 12 dollars a pound at some health food stores, but you can make it much cheaper at home. 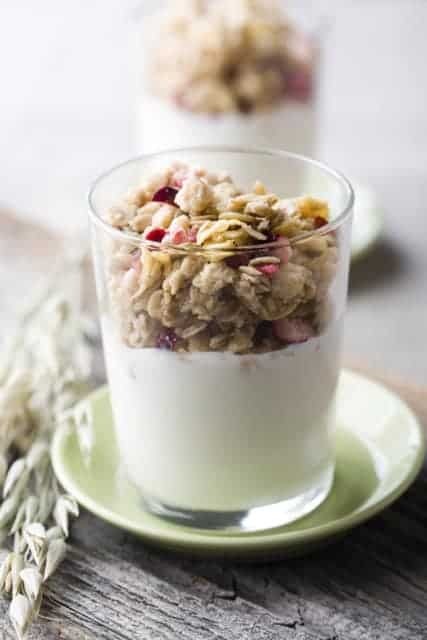 I personally love to top yogurt with a little crunchy granola, it also goes so well with a bowl of milk in the morning. While I love granola, sometimes it is really expensive, and its really just oatmeal, so I thought why not try making my own homemade granola recipe. Turns out, its easy to make, did I mention very easy. If you have a bowl, a measuring cup, a spoon, and a baking pan, you have all of the kitchen equipment you will need to make this wonderful breakfast or heck, even snack food. All granola works off of a basic function, oatmeal, dried fruit, dried nuts, and a sweet base to combine all of this goodness together. You simply combine everything and bake, when it cools off you get to store the granola goodness. For my recipe we are using oatmeal, Craisins, almonds, and a sweet mixture made of brown sugar and maple syrup. You could use any dried fruit that you like, but if the dried fruit is very large you will need to chop it into smaller pieces. You may also want to add in your dried fruits after baking. I find that raisins, and Craisins hold up well in the baking process but if you want to add fruit like dried blueberries, mango, pineapple, dried cherries, you will want to stir those in later. For my recipe I am using coconut oil, I like to use coconut oil when I can, because of its health benefits, and it may give your granola a little extra added granola flavor. You should use a neutral vegetable oil if you aren’t using coconut oil. I find canola, corn, and sun flower oil all to work very well. While I haven’t tried using peanut oil, I think that would be a good one to use as well. You can store your homemade granola recipe in a large air tight container. This will stay fresh for about a month. You know what, your granola isn’t going to last that long. So why not give making your own homemade granola a try? You don't need to buy expensive granola from the store, you can make homemade granola at home. In a large bowl combine oil, brown sugar, maple syrup, vanilla, almond extract, and salt. Stir to blend until it is a uniform mixture. Add in oatmeal, Craisins, and almonds. Stir until the granola is evenly coated. Spray a jelly roll pan with non-stick spray and spread granola over the pan. Press the granola until it is even. Bake for 40 to 45 minutes or until the granola is golden brown. Allow the granola to cool to room temperature and store in an air tight container. I have been buying a bag of Bare Naked granola to add to a Greek yogurt parfait that I use as a meal substitute (or snack). The GY has a lot of protein, some strawberries and/or blueberries add color and a little kick, and the granola adds some crunch and a hint of vanilla. But the BN granola is really pricey and I think I can do as well making my own. This recipe looks like a good start. Do you think that sucralose could be used as a sweetener? I’m limiting my sugar intake and would prefer to use a low-sugar recipe but want to keep the sweetiness the granola adds. It’s also nice to have a bowl of cereal now and again. It brings back my childhood. I break up graham crackers into bite size pieces and a 1 teaspoon of cinnamon in addition to your recipe, very tasty. You variation sounds very tasty. I will have to try this soon. Granola for breakfast = no cholesterol..Use any nut and seed you like, almonds are best, Use any sweetener you like that is good for you and add any kind of dried fruit your heart desires..Bake at 325 in jelly roll pans, stirring every 15 minutes for 1 hr and 15 minutes..Let cool before adding the dried fruit..Chop the nuts and dice the fruit..It not only good, but good for you..
It’s a total win isn’t it. I love your suggestions. Do you have a brand of oatmeal you like over others? I’ve been meaning to do this for some time now. Looks like I’ll actually have to do it now because I just saw the prices of granola in various stores and had a serious case of sticker shock. Horrible how expensive it is! I hope you give this a try. Making homemade granola is very easy to do. It is horrifically expensive in the store. This sounds like a real winner! Can I use honey instead of maple syrup? I think the honey would work well too. Let me know how it goes. Have never made granola before, but definitely making this one!!!! Can pecans or walnuts be used in place of almonds or are they better? Thanks for posting the recipe!!!! I would encourage you to use what you like best. For me that would be almonds 😉 Let me know how you change this recipe up.